It’s no secret I’m a big fan of marketing online. After all, it takes credit for cutting our marketing budget by over 50%. We publish regular articles to our website, optimize for search, and develop relationships with a great group of email subscribers interested in our content (thanks if you are one and reading this)! What might surprise you is it took me awhile to warm up to social media. I recognized its social purpose, but for business? I mean who really cares what you had for lunch? I figured out how to get LinkedIn with like-minded people! 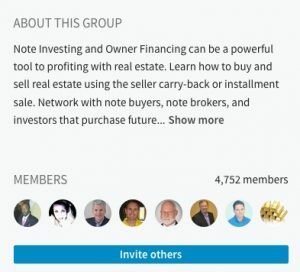 Finding it difficult to locate an online group dedicated to the seller financed note business, it dawned on me to just create one. We create notes when banks don’t fill the need, so why not do the same? 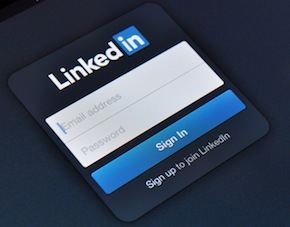 In 2009 the LinkedIn Note Investor Group was created. Fast-forward to 2017 and we are now 4,750+ members strong! The group is moderated meaning that members need to join and discussions must be approved. This helps reduce the spam and keeps the focus on buying and selling cash flow notes. Sorry but you don’t get to be the mystery man (or woman) with the grey profile. It just doesn’t work for building trust in business. Add a photo – no matter how much you don’t want to. Let people know how to get a hold of you by phone and email. Don’t forget to add a link to your website. This is very valuable in providing credibility and building traffic (and it helps your website rankings). Complete your profile with work experience, education, awards, and interests. While this looks a bit like a resume it doesn’t have to be quite so stuffy. It’s OK to show some personality while still keeping it professional. Of course I think you should join the Note Investor Group but there are lots of others out there. Personally I’ve joined groups related to real estate investing, self-directed IRAs, cash flow investing, online marketing, and local business networking groups. In addition to creating a personal profile you can create a business page (this is similar to Facebook and Google+). It is worth taking the time to complete both types of profiles. Share useful articles and comment on discussions to start building relationships. Just be sure to keep it professional. While cute kitten videos might work on Facebook it does not fly on LinkedIn. If someone takes the time to endorse you for a skill then be sure to return the favor (provided you can personally vouch for their expertise). Oh, and if you can’t find exactly what you are looking for you can always start your own group!